If extra seating is your goal when it comes to adding an island to your kitchen, then it is important to know how to choose the right stools for your space. First, consider these questions: How many seats are you seeking? How high is the bar? What type of seats would fit your kitchen style? Once you have determined the design of your kitchen island, you can then begin planning for a bar space and the stools that will most appropriately fit. In order to determine how many stools will fit at your kitchen island, home experts recommend you allow 28 to 30 inches for each seating space, which means you can divide the length of your island's counter by 30 to to figure out how many stools will comfortably fit. 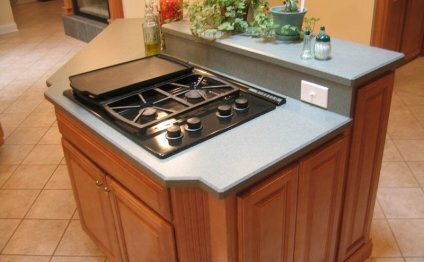 (For example, if your island has a 90-inch countertop, you can comfortably fit 3 stools along one side.) You might be tempted to add an extra seat, but keep in mind that you don't want to pack in too many stools and block walkways or make your kitchen feel cramped. Bar stools come in all shapes, sizes and colors. Metal, wooden and fabric-covered stools are available, in addition to backless stools and ones that have arm rests. If your stools are covered with a material, then choose a fabric in a spill-friendly color or one that will easily resist a stain.